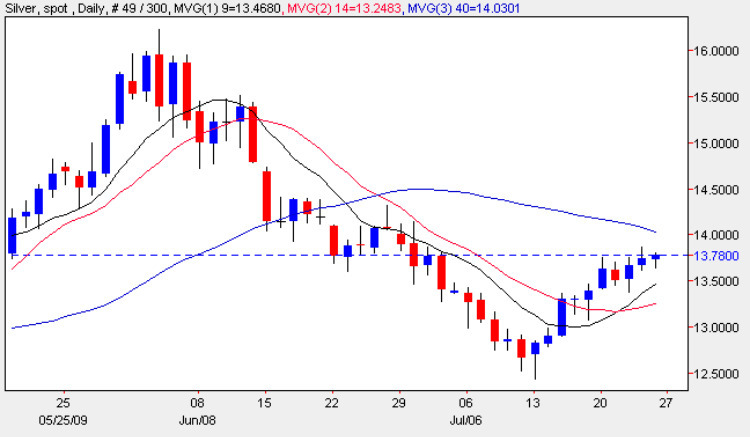 In yesterday’s market commentary for silver prices, I expressed some concerns regarding the weak signals of the last few days, with each day’s price failing to breach the $13.75 per ounce level before falling back, and whilst yesterday’s candle finally managed to hold above this point, the candle was far from convincing, ending the day as a small upthrust or shooting star pattern, which suggests weakness once again. Indeed when we analyse the daily gold chart, the picture here is bearish in the short term, with a strong shooting star candle yesterday, suggesting that we may well see a fall in both gold and silver prices in the short term as a result. For any sustained break higher and for these signals to be ignored we need to see a break and hold above the 40 day moving average, coupled with a breach of the strong resistance in place at the $14 per ounce level. However, the market now appears to be ‘tired’ and with little perceived momentum to move higher, spot silver prices will no doubt fall back should the above factors not materialise. As with gold the key to the price of silver may lie in both the weekly and monthly charts which I will be considering early next week.